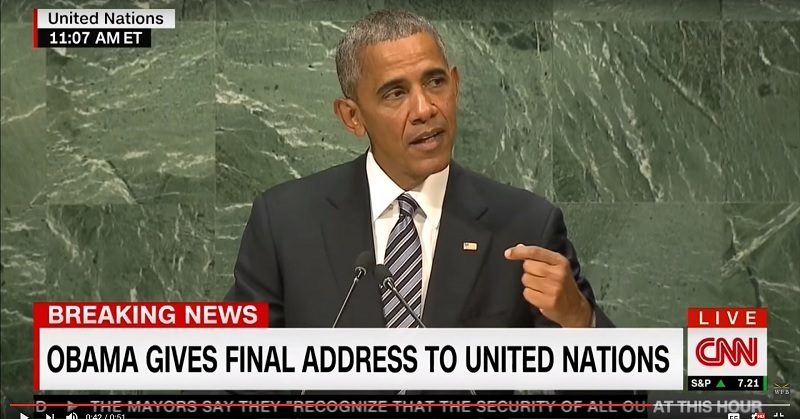 Only by submitting to a one-world-style government can the countries of the world effectively fight terror, Barack Obama warned during a speech to the United Nations General Assembly. In what will likely be his last speech before the body, Obama told the audience that he believes global security can only be achieved with the help of international institutions like the UN. Obama said “powerful nations” like the United States will have to accept constraints and give up some of their freedoms. The president acknowledged that he has been criticized by his own citizens for this belief but he remains convinced he is right. Obama also stated that while countries will have to accept some limits on their freedom, they should not give up autonomous rights like the freedom to defend themselves. Make no mistake – calling for the transfer of America’s sovereign rights – in trade, diplomacy, military allocation – anything to a one-world body is beyond dangerous. The transcript of his full remarks can be found here.